They must be mad, literally mad | The Nation said No Thanks! ‘They must be mad, literally mad’ is how I feel about the tweet above, the person who posted it, and all those who’ve liked it. Their souls and brains seem to have migrated to a far place where sane human beings cannot penetrate. Alison Brown (a.k.a. 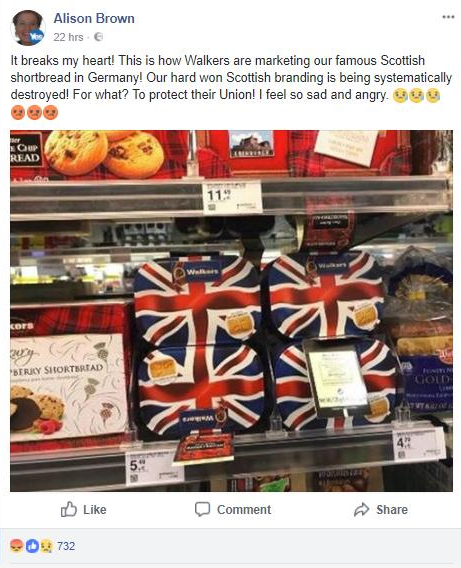 Alison Rollo, who once looked forward to the demise of elderly unionists) posted this objection on Facebook to Walkers, a great Speyside company, marketing their shortbread in Germany in a tin whose lid is in the form of a union flag. The Herald newspaper picked this up and concocted a lazy story out of it with the headline ‘Complaints over Walkers’ shortbread sold under a Union Flag’. It was lazy because, in the modern impoverished-media style, it did little more than string a number of Facebook comments and tweets together and add a response from Walkers. By the time they did so Ms Brown’s broken heart had been shared over 900 times (presumably approvingly) on Facebook. Old social media hands will know what happened next: Twitter for one went into overdrive with approval and denunciations of Brown/Walkers in equal measure, much of it in the intemperate tones we’ve all come to expect. This didn’t quite match the brief factual statement issued by the company which they clarified to at least one enquirer by adding ‘All other comments in the media may not be reliable’. In other words the ‘faux pas’ claim was itself faux. But hey, it’s 2018 and who cares about fake news. The highlight of the day’s madness (remember this is all about a label on a tin of biscuits) came when an online nationalist claimed unionists were obsessed with flags. As I write, the row has rumbled on overnight. It’s not the first of its kind (remember the great Tunnock’s teacake protest?) nor will it be the last. It seems hardly a day goes by without someone proposing a boycott of some hapless organisation that has had the temerity to display the wrong flag on its packaging, or even fail to display the right flag. Someone discovers their driving licence has a small union flag printed on it, posts a defaced photo of it and a new round of outrage is set off. And in a special kind of crazy but clever corner, Glasgow SNP councillor Mhairi Hunter, who tweeted ‘I do feel sorry for shortbread makers. Mind the old days when shortbread was quite a fancy alternative to bourbons, custard creams & the like. Who eats them now? …’ Note how she manages to put down the likes of Walkers without mentioning them by name. As for comparing shortbread to custard creams, as a friend of mine says ‘Nae appreciation and even less understanding’. Ms Brown’s Facebook message sets the tone for the brighter (the word is relative) members of the online mob who have piled in to support her – their concern, they say, is ‘hard won Scottish branding’ or ‘Scotland the brand’. They confuse national identity (which is really what they’re concerned about) with commercial success. The two things can overlap. But if you want a successful economy, let successful companies decide how to brand their products and services. Do they imagine that Walkers haven’t done their market research in Germany to establish that there’s a niche for shortbread that is branded with union flag alongside the vast majority of their products that shout Scottish at you? 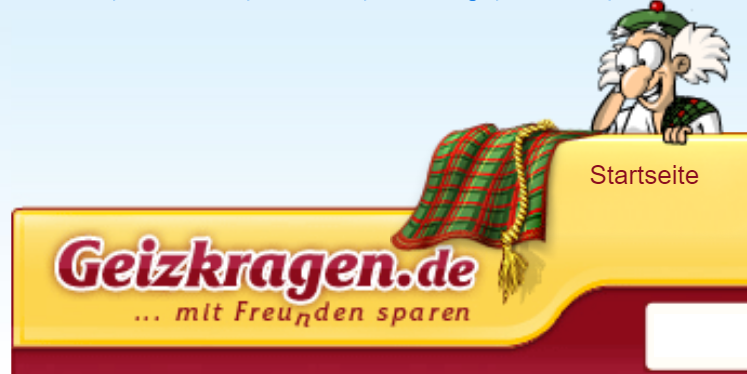 ‘Geizkragen’ is German for miser in case you didn’t know. Ex-SNP deputy leader Angus Robertson criticised this caricature of the mean Scot in 2009 but it clearly persists (this image was snipped from the web today). If the broken-hearted nationalists so protective of Scotland the brand were really concerned, they’d mount a sustained campaign against what a whole nation seems to think of Scotland. But since it wouldn’t involve a tin of biscuits and a flag I guess they’re not interested. Footnote: Oxford English Dictionary – ‘Madness … a state of wild or chaotic activity’. This entry was posted in Uncategorized and tagged facts, flags, Germany, grievance, myth, nationalism, news, Scotland, shortbread, social media. Bookmark the permalink. ‘There is something rotten in the state of Denmark’ – to paraphrase the Bard. Replace Denmark with Scotland and you’re there. I’ve said it before, and no doubt I’ll have occasion to say it again before this is all over: I was never embarrassed to be Scottish in my life until the SNP took power. More than that, I think, as nationalists they believe they somehow own that identity and have the right to direct its usage. It’s all part of that nation-party-state conflation that defines nationalism. And they see it as zero-sum. You can’t be both British and Scottish. I mean, look at this particular example this way… You know I’m pro-Brexit. If I saw a bottle of whisky on sale in, I don’t know, Taiwan, emblazoned with the Ring of Stars, it might sadden me a little, but I wouldn’t be outraged. I get it. Its European origin is obviously attractive to that market. * I woudn’t even be too upset if they continued to use it even after we leave. What matters to me in that debate is the way we’re governed, not the symbolism of nationhood or identity. So what this little incident really shows, for me, is how much real hatred there is among nationalists, not for “the Westminster System”, but for Britishness itself. They always protest otherwise, but sometimes – all too often – the mask slips. Imagine being the owners of Walkers. You have done more for Scotland – employed thousands, created huge wealth, generated taxes – than all of Nicola Sturgeon’s band of freaks combined; yet you find yourself being attacked and having to explain yourself to them. As a point of principle – and I’m not kidding when I say this – if I was in charge of the business I would immediately close it down, Atlas Shrugged-style, and say to the SNP government, ‘You think you can do better? Well, I’ll sell you the business for (say) a billion pounds.’ Then I would sit back, count the money, and laugh while the nationalist cretins ran it into the ground. And, if they didn’t buy it, I would still laugh while the nationalists tried to explain to their moron followers how they were responsible for putting hundreds of people out of work and destroying Moray.